Ruckus | Innovative Network Solutions, Inc.
INS is proud to be a Ruckus "Big Dog" Partner, officially authorized for sales and installation of Ruckus wireless systems. Our excitement to partner with Ruckus is because Ruckus is the future of WiFi, and what their technology has accomplished is nothing short of amazing. Are you concerned with the coverage, stability, and speed of your wireless networks? Have you (or your visiting customers) ever been frustrated by slow speeds or dead zones in the workplace? Ruckus’ patented Smart WiFi technology is a breakthrough that rids the world of these nuisances once and for all. Here’s how it works. Smart Wi-Fi combines sophisticated algorithms for best-path-selection with high-gain adaptive antenna technology to dynamically form and direct Wi-Fi signals over the highest performance paths. Smart Wi-Fi is constantly, actively steering signals around obstructions, alleviating interference, and focusing RF energy only where it's needed, achieving landmark coverage and unfailing performance at much longer ranges. 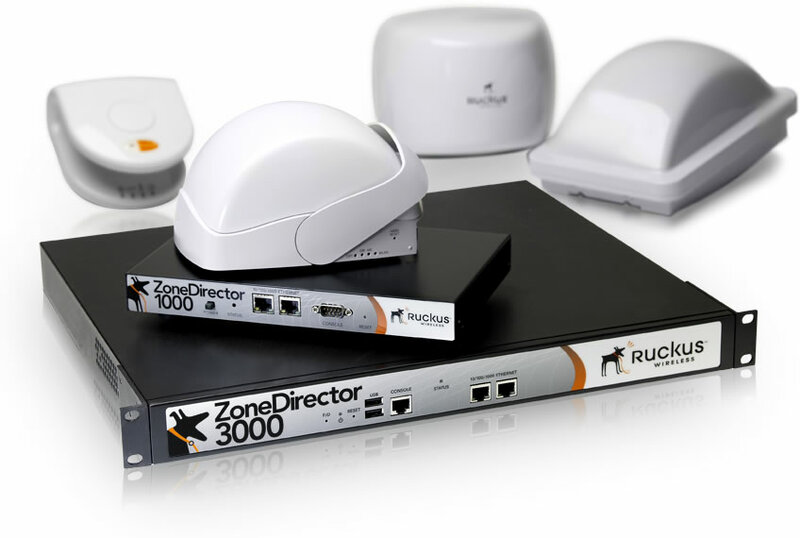 We have found Ruckus systems to dramatically improve wireless access, speed, and stability. When we upgrade your network, you’re not just improving the efficiency of your workplace now – saving you time and money – you are staying ahead of the cutting edge in technology, so that as wireless speed and dependability become exponentially more critical, you have already made the investment in securing your productivity. For a limited time, INS is able to secure steep discounts on all Ruckus upgrades to your network. We can achieve this level of affordability only because we are a certified Big Dog business partner with Ruckus. Replace your old a/b/g/n access points with the world’s first 802.11ac Wave 2 access point for unmatched performance, or the specially priced 802.11ac Wave 1 access point for a great balance between cost and performance. Hundreds of thousands of locations around the world have deployed Ruckus Wi-Fi systems with patented BeamFlex™ technology. ZoneFlex™ Smart WLAN WLAN systems, the flagship of the Ruckus product line, give enterprises a full range of indoor and outdoor Wi-Fi solutions for any conceivable application; streaming IP-based video over Wi-Fi, 3G offloading, wireless broadband access, high-speed 802.11n wireless LANs...the possibilities are endless. ZoneFlex alone combines Smart Wi-Fi and Smart Mesh networking technology in one centralized Smart WLAN system – and it does so without breaking the bank. At INS, we believe in treating every client as if they are our only client, focusing on the needs and best wireless solutions for their specific situation. Our priority is maximizing your business potential through superior IT services. Since we believe our work is about people, not machines, we treat each of our projects with care directed toward those impacted by our success; the real people in your workplace and the customers impacted by your workplace efficiency. Call our office today and let us help you determine what Ruckus system is right for you! Interested in buying Ruckus products? Use our Equipment Purchasing form to receive a quote within 24 hours!